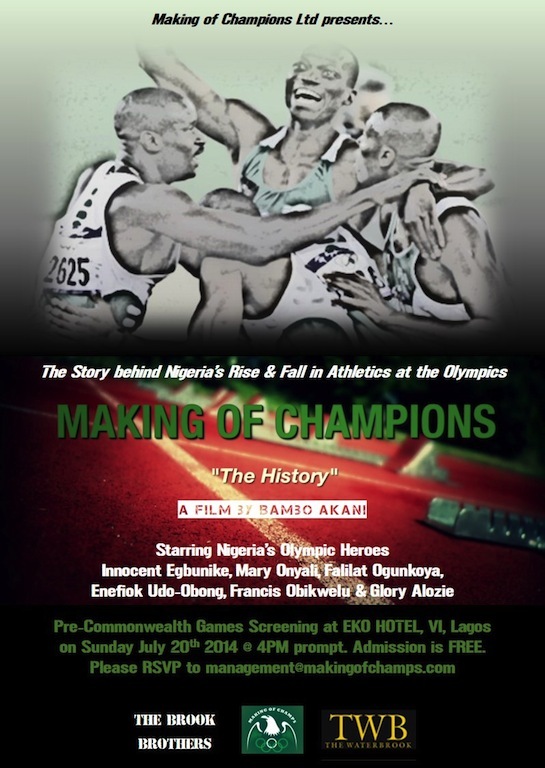 MAKING OF CHAMPIONS FILM SCREENING @ EKO HOTEL on Sunday July 20th @ 4pm! With the World Cup now over, and Team Nigeria getting ready to go in the Commonwealth Games starting this week, Making of Champions Ltd brings you the EXCLUSIVE Pre-Commonwealth Games screening of our new Athletics Documentary Film, MAKING OF CHAMPIONS: “The History”! See below for the synopsis and teaser for the film! Let’s get behind Team Nigeria and Make Champions! Admission is FREE, however be sure to RSVP to management@makingofchamps.com to confirm your attendance! We hope to see you there on Sunday! In late 2012, independent filmmaker Bambo Akani started the journey of making the feature-length documentary, Making of Champions: “The History” after seeing a country as populous as Nigeria, blessed with so many people of natural athletic ability, return from the London 2012 Olympics with a sum total of ZERO medals – the first time Nigeria had failed to medal at the Olympics since Seoul ’88. In truth, the decline has been steady since the Sydney 2000 Olympics – we just did not realise it. Making of Champions: “The History” traverses the globe to meet Nigeria’s former Olympic heroes and tell the stories of how they won their Olympic medals – Mary Onyali, Falilat Ogunkoya and Enefiok Udo-Obong, the only double Olympic medallists in Nigeria’s history, and Innocent Egbunike who was Nigeria’s head coach at the London 2012 Olympics. We meet former Nigerian medallists Francis Obikwelu and Glory Alozie in Portugal and Spain respectively, to find out why they switched from Nigeria to represent their adopted countries and finally, we meet all of Jamaica’s star athletes, such as Yohan Blake and Shelly-Ann Fraser-Pryce, to find out why the Jamaicans are so fast! The ultimate goal for the film is to awaken Nigerians to the vast potential we have in Track and Field, rekindle the national interest for the sport, and start a movement that will enable Team Nigeria to once again compete with the best in the world! Why have we fallen so far? How can we get back to winning medals on the global stage? What does it take to Make Champions in Track and Field? This film answers all these questions and more, and is a call to arms for Nigerians everywhere to ensure that the legacy of heroes past is not lost forever in a sport in which Nigeria has limitless potential! ← Okagbare settles for third place as Schippers stuns 200m field at Glasgow Diamond League!